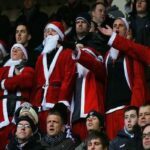 We may have not have any football or betting action until Boxing Day, but we have plenty of time to have a closer look at special markets that bookies are offering for that day. So let’s see some of them. Team to score more goals: Would it be Liverpool(11/5) or Manchester United(3/1)? Or maybe Manchester City(16/5)? Can you really tell? If you think you can then just go for it. Total Goals: We think that there will be a lot more than 28,5, so we think that the odds given (7/10) are more than fair. How many Home Wins: Same here. 7/10 if there will be more than 3,5. How many Red Cards: 27/20 if there will be more than 1,5 or 4/7 if you think there will be less than that. What do you think? How many Own Goals: No own goal at 7/5. Three or more 7/1. Really? Worth the risk anyway. Boxing Day is always a very interesting day. You can make it a very rewarding day also. Best of luck and Merry Christmas!